Bananas are a tropical fruit that grows on a plant that reaches a height of 10 to 25 feet. The bananas are supported on a large heavy stem and grow with the individual stems facing downward. Bananas are always picked green and ripen on the way to market. 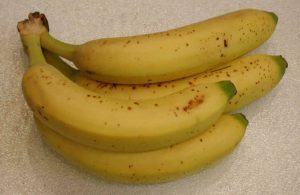 When ripe, bananas lose their green color and begin to get small brown spots on their yellow skin. The last remaining green color can be seen at the tips of the bananas in the photo. See nutritional information chart below.